"Are you ready for the holidays? 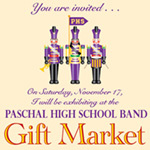 Find everything you need at the Paschal Gift Market! We will have more than 60 vendors offering unique gift items like handmade jewelry, unusual clothing, food gifts, wood carvings....you never know what you will find. Admission and parking are FREE. Have some great coffee and pastries in our cafe while you sit and enjoy live music. It's a lovely shopping experience. Don't miss it!" Corner of Berry Street & Forest Park Blvd. Booths are 6 X 16 and cost $85. This fee includes 1 sack lunch. Chairs available on request. Limited electricity available for an additional $25. Applications are available here and are due by November 2nd, 2012. For more information, visit their website or contact their event coordinator, Karen, at giftmarket@paschalpanthers.org / 817-731-1902 home / 817-368-6883 cell. Unique Etsy-type stuff does very well. Imported items and pottery usually sell out! They give great vendor support with promotional materials for the vendors and strong boys to move your stuff.